A fantasy scent to compliment the exquisite beauty of the Bird of Paradise flower found in tropical climates. A calming tropical blend of sweet strawberries, juicy pomegranate, creamy vanilla, and coconut milk with hints of rose petals and soft jasmine. 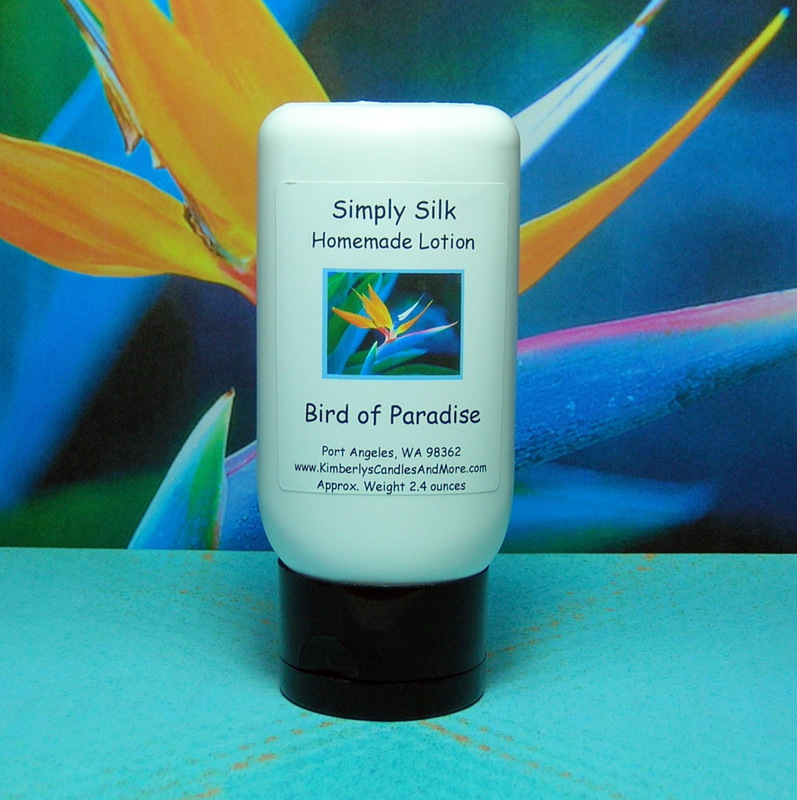 Simply Silk Lotion is a non-greasy, incredibly silky lotion for your hands and body. Made with conditioning silk proteins for a nice silky feel and Abyssinian oil for added conditioning benefits. You'll enjoy the incredibly silky skin feel and the fast, non-greasy absorption of this wonderful lotion. *This lotion is not a base, but is handmade. Cooked it in my kitchen myself! * *Approximate weight is 2.4 ounces* SHIPPING INFORMATION: The shipping prices you see is only an estimate. If the actual cost is more than 1.00 off, I will gladly refund you the difference. If I didn't charge enough, then I'll pay the extra. You will not pay anymore then what is listed! INCI; Water, Cyclopentasiloxane, Dimethicone, Dimethicone/Vinyl Dimethicone Crosspolymer, Emulsifying Wax NF, Abyssinian Oil, Behentrimonium Methosulfate, Cetearyl Alcohol, Silk Amino Acids, Caprylic/Capric Triglyceride, Disodium EDTA, Propylene Glycol, Diazolidinyl Urea, Iodopropynyl Butyicabamate, fragrance.